Question: What are the two pitches in music called? Albert’s reply: There aren’t just two pitches in music, there are as many pitches as there are colors. 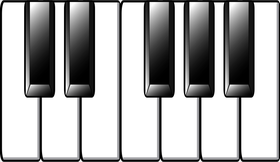 However, we can reduce these still further to only the white keys. 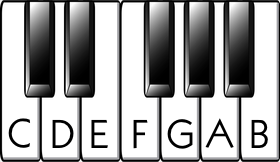 These are the primary notes in Western music, meaning that others (those with sharps or flats) are derived from them. To help you understand the difference between notes and pitches, think of a rainbow. Coincidentally, just like the seven naturals in music, a rainbow has seven distinct colors: red, orange, yellow, green, blue, indigo and violet. Yet a rainbow actually has an infinite number of colors since they comprise the entire color spectrum. Whether the explanation is cultural or biological or both, we just happen to “see” only seven colors. If a color is slightly off “true” green but not close enough to blue, we still see it as green in a rainbow. Yet some orchestras, such as the Vienna Philharmonic, tune the A slightly higher to 443 Hz for a brighter sound. All the other notes are tuned around this A, so the actual pitch (the number of vibrations per second) changes accordingly. It’s like saying the Vienna Philharmonic uses a slightly “more indigo indigo” as a reference. It’s still “indigo enough” to be considered indigo. Historically, the pitch of A actually ran the gamut from 309 to over 480 Hz, according to definitive research I’ve seen. That’s like picking any color of the rainbow and calling it indigo!